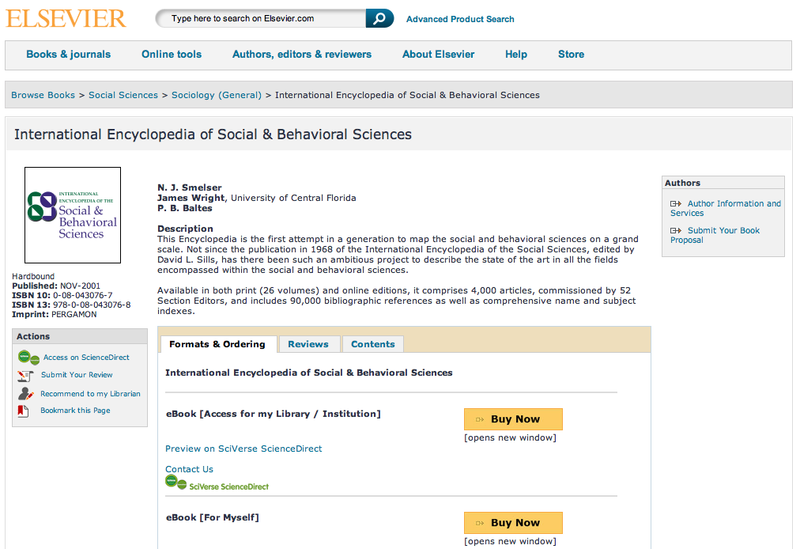 The International Encyclopedia of the Social & Behavioural Sciences (IESBS) is a 24 volumes outstanding reference work. Its online version is accessible via the online database platform ScienceDirect®. The Encyclopedia contains almost 4,000 articles and 90,000 bibliographic references as well as 150 biographical entries. Articles are supported by abstracts prepared specifically for the electronic edition and put online as they become available, offering an extended preview of the Encyclopedia’s content in advance. Institutional subscription is required for full-text entry articles, while free browsing up to the abstract level, linked with a rich number of cross references, is possible also for guest users. A few full-text sample articles are also available. Reference linking takes the user from cited references within articles to the source abstract (even for non-ScienceDirect subscribers, seamless linking within ScienceDirect is supported). The IESBS web pages are part of the Elsevier website and are therefeore a mere presentation of the product. For accessing entries and retrieving material, users are automatically redirected to the ScienceDirect platform website. Advanced search features are offered for subscribing institutions and their users. What is the nature of political theory?